http://iNotes4You.com is powered by WordPress.com. WP is the worldwide largest offer for free Blogs (35 million) with a lot of pre-defined functionalities so that everybody is able to publish articles within less than one day. In contrast to self-hosted blogs on WordPress.org there are some limitations regarding plug-ins, design and source code because of security reasons. WP offers a lot of free themes one can use for the layout of the website. So I did when choosing the theme FRESHY. I started blogging in October 2012 without any knowledge of programming a website. And at the time I still don’t have this knowledge and I don’t want to spend my time with administrating a complex website and annoying the readers with intrusive advertisement. This blog goes along the line of ‘Back to content.’. If you look on my About page you will see that my native language is German. So be sympathetic if you stumble upon words or phrases you never heard before. This may happen when a German word is translated by a free iPad app. I completely lost faith in this iOS lady named SIRI doing such things for me. INotes4You’s blog uses Akismet (short word for Automattic Kismet). Akismet is brought to bloggers by Automattic (not misspelled, it’s the companies name), the creators of WordPress.com. For over 5 years, Automattic has been committed to fighting spam by continually improving the Akismet algorithm. Spam most people know; it’s the unwanted commercial commenting or mailing. Ham is the counterpart, legitimate comments. On the Akismet mistakes side, missed spam is pretty self-explanatory, and a false positive is a legitimate comment incorrectly identified as spam. Each time a new comment, trackback, or pingback is added to my site it’s submitted to the Akismet web service which runs hundreds of tests on the comment and returns a thumbs up or thumbs down. I check the content recognized as spam (because Akismet may made a mistake) and then delete it, if I only see ads or soft-soaping. Up to now more than 2,500 comments have been identified as spam within just 6 months. Sorry, if Akismet and I made a mistake, which I hope happens very rarely. Use the contact form on my About page to kvetch. For those who just started reading blogs here is a description of the functionalities of my WordPress.com blog. My blog is about Apple’s iOS devices so it’s obvious that a WordPress.com option (Mobile Theme) is activated. 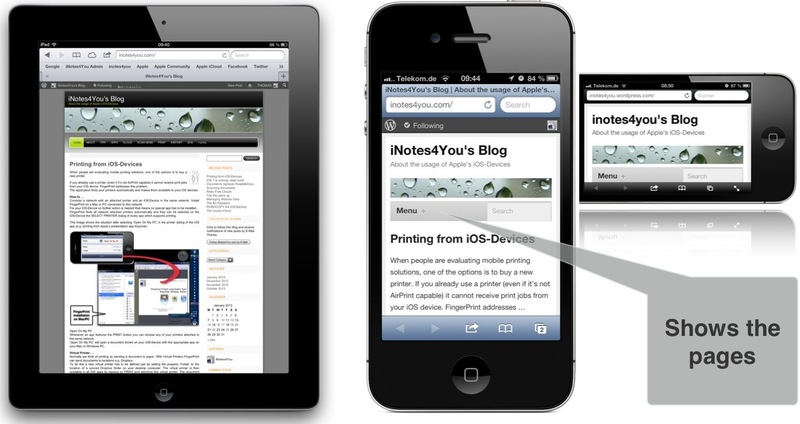 It ensures an optimized display of the site even on the iPhone. There are two functionalities that can be used for finding out the which articles may be interesting for you. Some bloggers build an extra page containing links to articles sometimes outlined by special criteria. But in time this list gets longer and longer and so it’s no real summary any longer. A mind map would be helpful. By opening a branch more detailed information could be presented. But the form factor of an iOS device hampers the clarity of this type of outlined information. So they are only two more traditional features available: Search and Categories. is a full-text search. If you enter a string all blogs are shown containing this string. The string may be a complete word, a part of a word or several words. If you enter ‘ios 7’ you get my blog from 2013-01-22.
are topics defined by myself. Categories are an additional Search-Feature. Open the categories box to see which categories are available at the time. If you select a category all blogs with this category assigned are displayed. shows the titles of the last 10 posts which covers about one month. is an optional notification feature. If you fill in your E-Mail address you will be informed immediately after a new article is published. The E-Mail contains a direct link to the article and is sent from WordPress.com to you. You may unsubscribe anytime by clicking on a link in the E-Mail. Numerous polls have found that Americans and not only Americans consider advertising mail to be intrusive. You never will get any advertisement mails when you subscribe to http://iNotes4You.com. You should know that this blog does not pursue any commercial purposes as it is hosted by WordPress COM. Only self-hosted blogs via WordPress ORG are allowed to be commercial. So just enjoy this blog like I do when writing for you. show the months with published articles. Tap on a month and the assigned articles are displayed. displays the actual month. Highlighted dates point to published articles. show the names or pseudonyms of contributing people. At the time it’s just me. If you want to become a contributor don’t hesitate to send me a short note via my page About. WordPress calls it Tag Cloud, a cloud looking list of tags (keywords) I assigned to my articles. This feature is completely generated by a WordPress.com software feature which extracts the assigned tags and composes them to the tag cloud. 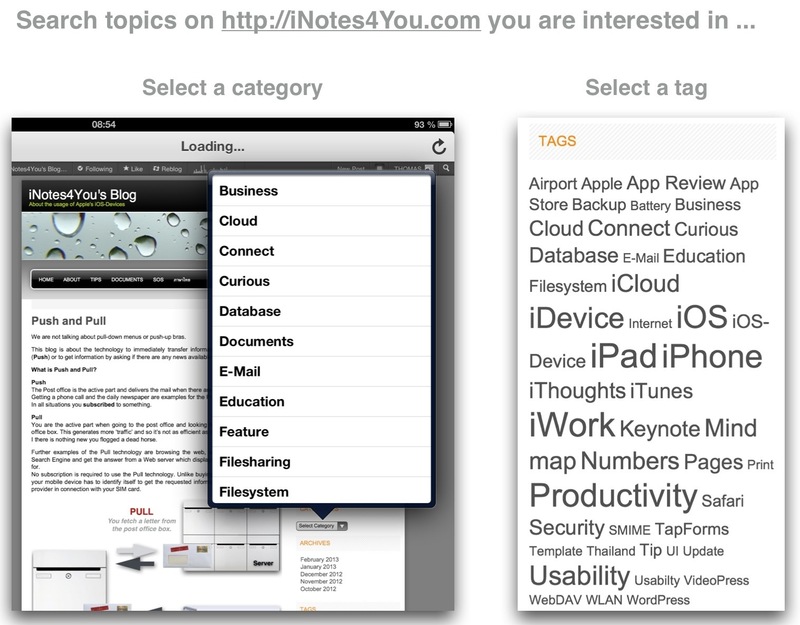 Tap on a tag to list all related articles. If you are engaged in social networking you may share single articles via Facebook or other social networks. All the networks you see are directly supported by WordPress. If you are a member of Twitter then tap on the Twitter button and a tweet is generated in your Twitter profile after your confirmation. That’s the easiest way to share information with your friends. This applies also to the other networks with slight differences. is the most important aspect for the writer. He get’s it if his readers tap on ‘Like’ (this requires a free WordPress.com account) or, more important for me, comment on an article, positive or negative. You will always get a reply from iNotes4You whatever you wrote with the well-known limitations valid for all published material. Your comment is never published immediately. It has to be approved by the author because he is responsible for everything displayed on his website. WordPress statistics tells me that there are readers in more than 80 countries with completely different time zones. So if you comment and get no approval in a narrow time frame I am sleeping or working on relevant things. Be sure I won’t forget you. 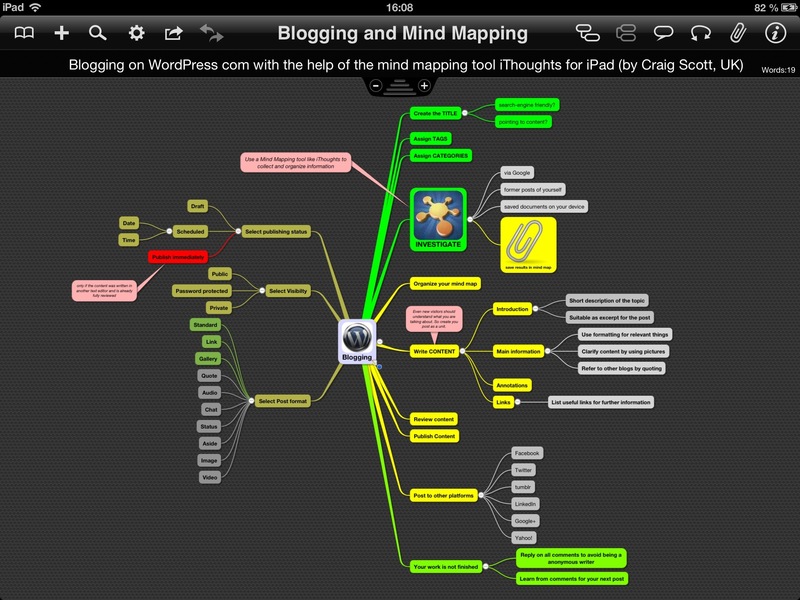 If you already blog on WordPress or plan to start blogging have a look at this mind map. It shows you what you have to do and what you should not forget before publishing an article. I created this map with the app iThoughts by Craig Scott (UK) on an iPad. The WordPress.com search engine indexes post, pages, and comments content (body text). You can limit search results with specific tags. To limit your search for mobile to posts specifically tagged with iphone you’d search for ‘tags:iphone mobile’. This works with multiple tags as well, ‘tags:iphone,apple mobile’. Find out what Om Malik said about mobile with a ‘username:om mobile’ search. 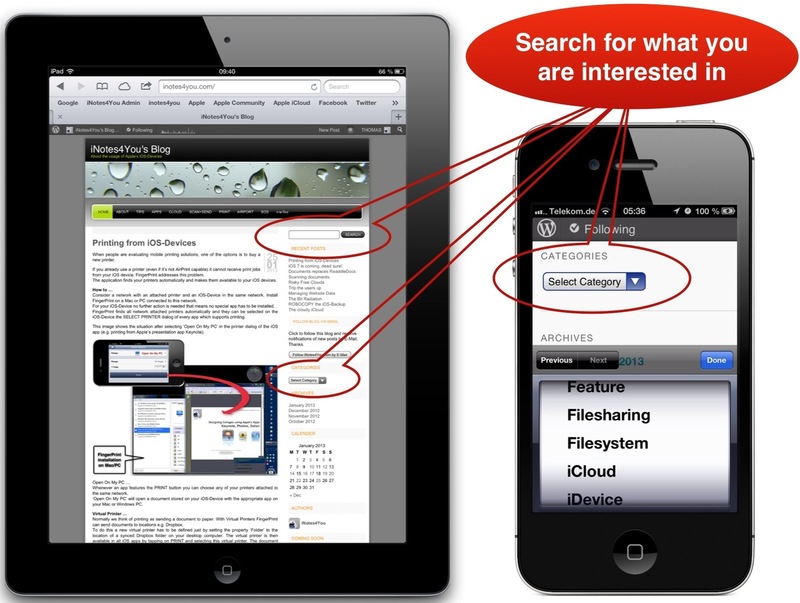 will limit results to just those on gigaom.com posted by Om Malik that have the tag iPhone and contain the word mobile. Thanks a lot for reading my blogs. Please use the available buttons for sharing on social networks.